So fresh and happy and quirky! Love those juice boxes, hehehehe. The juice boxes are awesome. What a fun way of getting kids to drink juice instead of soda. Those juice boxes are beyond adorable! I love when everyday products reflect good design. Those juice boxes are so cute! i have to agree - i love those juice boxes! Love the apple pot! How cute! Ah! Yes! I've seen these. If only the whole world of package designers were this creative & innovative! LOVE! 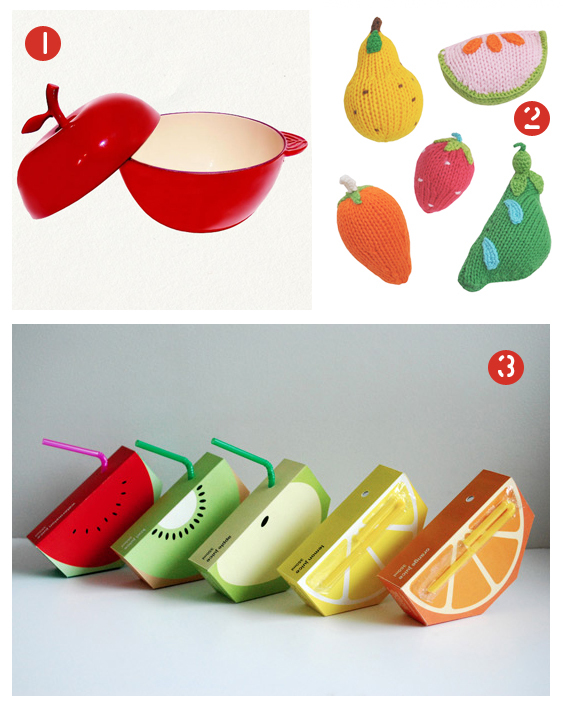 love those fruit boxes, somehow they are making me rather thirsty! oooh love the stitched strawberry. and those juiceboxes are creative, creative, creative. Those look so cute. Our home definitely needs some color. Another great fruit find: my daughter LOVES this "cuttable" wooden fruit from Melissa and Doug (http://www.amazon.com/Melissa-Doug-Deluxe-Wooden-Cutting/dp/B000NV9G88) that she got for Christmas last year. love the juice boxes. i've been thinking about a lemon/lime birthday party theme and those would be perfect. thanks for sharing. How fun! What a nice little collection for a very cold day. Feeling very inspired..lovely design ideas..
ahhh those juice boxes blew.my.mind! perfect! I love your blog, bytheway. love the fruit juice boxes!!! I wouldn't want to throw them away!